A little bit sweet for one member of the family, however a superb sausage both in terms of taste and texture as far as I am concerned. The Sweet Italian is a longer thinner variety than a usual banger, with flavours of white wine, garlic, fennel, oregano, black pepper and honey bursting through. 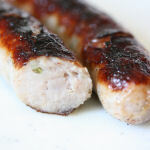 In fact I watched as these were made to order at the Churchgate Sausage Shop, Mayfields Farm, Sheering Road, Old Harlow, Essex... and then within 30 minutes, they were in the pan sizzling away. Approx 85% meat within natural skins we are informed. Not too tightly packed, with a medium firm texture with a skin that gives easily to the bite. Cooked and then eaten cold later they're really good too. Sliced up with a tomato sauce and tagliatelle pasta for lunch is a real treat. 210x20mm before cooking, 205x18mm after. 67g before cooking, 58g after. That's a shrinkage of approx 12%.